While we just saw the Nokia 3310 prank, popular mobile browser UC Browser decided to try something healthier and updated their browser to help you lose weight. 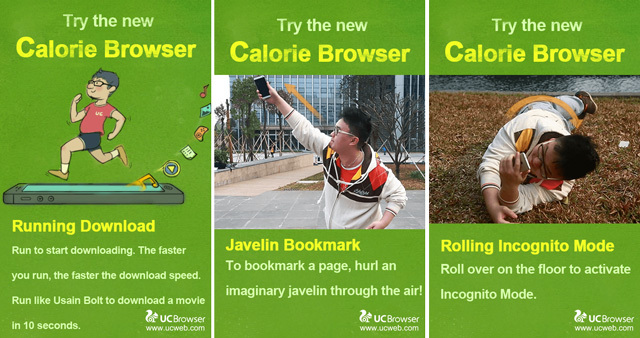 UC Browser updated its mobile browser to Calorie Browser which apparently can help you burn calories while surfing the web. The high-tech browser is said to use body gesture control technology to perform browsing functions. While the company always claimed to be dedicated to an excellent web experience, today the company gives a “healthy, all-in-one web experience”. With the body gesture control technology introduced in the Calorie Browser, users need to spin like a ballet dancer to refresh the page. To zoom in to the page, you need to swim the breaststroke. Rolling on the floor (laughing probably) will automatically activate the incognito mode. You can also hurl an imaginary javelin through the air to bookmark a page. However the best feature of the Calorie Browser and our personal favourite is running like Usain Bolt to download a movie in 10 seconds. Sadly this an April Fools prank. Had this been true, we would be the fittest living beings on earth.